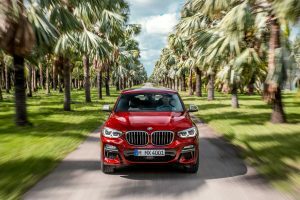 February 14, 2018, the second generation BMW X4 is made its debut as the BMW X4 M40i and the BMW X4 xDrive30i. The 2019 BMW X4 with sportier proportions, with wider tracks, the latest generation suspension settings, a lower center of gravity and improved aerodynamics. The second generation Sports Activity Coupe offers a wide array of new standard safety features such as Active Protection which initiates protective measures when an accident situation is imminent such as belt tensioning and the closing of windows and moonroof to a small gap. Additionally, the standard Active Guard includes Frontal Collision Warning, City Collision Mitigation with Braking, Pedestrian Warning with City Braking, and Speed Limit Information. Standard Navigation comes with a large 10.25 inch display and offers drivers multiple ways to interact including touchscreen, iDrive Touch Controller, as well as a cloud powered intelligent voice control, the optional 75 percent larger, color Head-Up Display provides drivers the option of viewing navigation directions just under the direct line of vision. Not only does the all-new BMW X4 appear sportier, provide new and improved driving dynamics, better aerodynamics and safety features, passengers can now enjoy a larger panoramic moonroof and a 3-Zone Climate Control system which allows for greater ride comfort. The all-new 2019 BMW X4 will be available at certified BMW Centers in July 2018 with pricing starting at $50,450 for 30i, and $60,450 for M40i plus Destination and Handling. Its predecessor – the first ever Sports Activity Coupe at the premium end of the mid-size segment– broke new ground. Today, the all-new BMW X4 is writing the next chapter in this story of success. More than 200,000 units of the first-generation X4 have been sold worldwide and 19,712 in the US alone since the original model was launched in 2014. 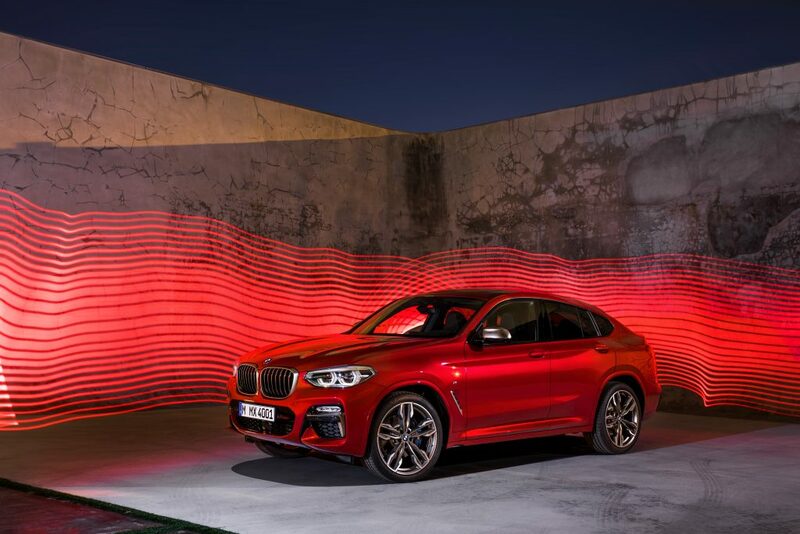 The all-new BMW X4 underscores its individual character with significantly enhanced driving dynamics, standout exterior design accentuating the car’s sporting instincts, a refined premium ambience in the interior, state-of-the-art driver assistance systems and leading-edge connectivity technologies. Additionally, the dynamic and extravagant aura of the Sports Activity Coupe is highlighted by the BMW M Performance model: the all-new BMW X4 M40i. The exterior design of the all-new BMW X4 features clean surfacing and high-class, modern accents. The BMW X4 assumes the role of eye-catching athlete in the BMW X model family. “The second-generation BMW X4 brings together a distinctive, dynamic silhouette with a clear, pared-back use of forms,” says Adrian van Hooydonk, Senior Vice President BMW Group Design. An increase of approximately 3 inches in exterior length to 187.5 inches, 2.1 inches added to the wheelbase (now 112.7 inches), an extra 1.4 inches of width (75 inches) and an approximately 0.1 inch drop in height (to 63.8 inches) give to the all-new BMW X4’s dynamically stretched proportions. Short overhangs and powerfully formed, subtly hexagonal wheel arches emphasize the nearly perfectly balanced 50:50 distribution of weight between the front and rear axle. In the center of the striking front end stands a large BMW kidney grille in a new three-dimensional look. Twin headlight units with dynamic contours and horizontal fog lamps integrated into the outer air intakes form a new interpretation of the familiar six-eyed face embraced by BMW X models. All of the light functions feature LED technology as standard. The shoulder line – following the door handles to the rear lights – and the character line between the wheel arches break up the surfaces of the car’s flanks. This creates clearly defined lines which are additionally emphasized by the drawn-in glasshouse at the rear. The coupe style roofline slides into the rear window with an elegant flourish before dipping down more steeply to the rear. The window design also underlines the dynamic proportions of the all-new BMW X4, thanks to a smoothly rising sill line and an elongated take on the Hofmeister kink “counter-swing” at the base of the C-pillars. Clearly structured surfaces and horizontal lines shape the car’s tail. The LED rear lights, with their three-dimensional shaping, are slim in design and positioned at the extreme edges of the rear. Combined with the twin exhaust tailpipes (shared by all engine variants), they magnify the width of the rear end. Two optional model variants allow drivers to tailor the appearance of the all-new BMW X4 to reflect their personal preference. Each variant comes with standalone design features as well as model-specific standard 19-inch light-alloy wheels. The robust nature of the Sports Activity Coupe is clearly expressed by the standard xLine design which combines bespoke front and rear underguard elements and side skirts in Glacier Silver metallic with side window surrounds and styling accents in a satin Aluminum finish. The M Performance model has an undeniably dynamic look, clearly stating its eagerness to deliver intense sportiness on the open road with its aerodynamically optimized front/rear aprons and side skirts, and accents in High-gloss Black. The all-new BMW X4 M40i can now also be specified with options from the BMW Individual portfolio. Extras designed to give the exterior an exceptionally exclusive feel include the BMW Individual paint finish Sunstone metallic. The interior cabin of the all-new BMW X4 is roomier with a premium feel. All controls are clearly arranged and set within trim finishers featuring a distinctly pared-down design. The low instrument panel and the slightly raised seating position typical of BMW X models afford drivers a superb view of the road ahead. The driver-focused layout of the cockpit helps to create a wonderfully sporty driving experience at all times. Redesigned sports seats with boldly contoured side bolsters provide outstanding lateral support even in extreme handling situations. Top-class materials, precise build quality and a host of meticulously crafted details set the tone for the modern and individual premium character of the all-new BMW X4. The surfaces of the instrument panel and door paneling merge smoothly into one another, while the X logos embossed into the electroplated surfaces of the front and rear doors are eye-catching details. 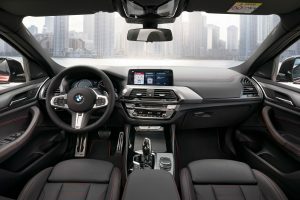 The ambient lighting, adding extra light sources around the center console and instrument panel, in the door paneling and in the foot wells, enhances the sense of wellbeing in the interior of the all-new BMW X4. The lighting mood can be adjusted as the driver pleases thanks to a choice of six colors. Large storage trays, roomy door pockets, cup holders and various compartments are all testimony to the functional qualities of the all-new BMW X4. A far wider array of options, offers greater scope for customers to increase both the comfort and functionality of the all-new BMW X4. The range includes electrically adjustable and heated seats, active seat ventilation and three-zone automatic climate control with separately adjustable temperature control in the rear. A standard panoramic glass moon roof with much larger dimensions than the predecessor offers passengers additional comfort. The two-section glass surface with an overall length of 36.4 inches and a width of 35 inches allows the amount of light in the interior and the supply of fresh air to be varied as required and creates space. The sun blind is electrically operated, as is the front section of the glass roof. Three full-size seats are fitted in the rear compartment of the all-new BMW X4, providing the passengers there with an additional 1 inch of legroom over the predecessor model. The trunk features a capacity of 18.5 ft³ and the load space can be expanded to a maximum of 50.5 ft³ as required by folding down the sections of the rear backrest, with its standard 40:20:40 split. For added ease, the backrest sections can be released remotely from the trunk, while their angle to be individually adjusted, too. The standard storage package adds additional compartments, USB ports and 12V sockets, as well as multifunctional hooks and lashing rails in the trunk. The all-new BMW X4 will be launched with a choice of latest-generation power units. The four-cylinder unit in the all-new BMW X4 xDrive30i generates 248 hp and peak torque of 258 lb-ft, which is on tap between 1,450 and 4,800 rpm. This enables the car to accelerate from 0 to 60 mph in 6 seconds. The BMW TwinPower Turbo technology for the gasoline engines comprises a twin-scroll turbocharger, High Precision Injection, VALVETRONIC fully variable valve timing and Double-VANOS variable camshaft control. The BMW M Performance model comes with an inline six-cylinder engine. Both model variants direct their engine’s power to the road via an eight-speed Steptronic transmission and BMW xDrive intelligent all-wheel drive as standard, resulting in effortless progress over smooth roads and rough terrain alike. Gear selections can be selected manually using the shift paddles on the steering wheel. The standard eight-speed Sport transmission offers exceptionally fast gear changes as well as a Launch Control function. The standard-fit Driving Experience Control switch lets drivers choose from SPORT, COMFORT and ECO PRO set-ups, while the BMW X4 M40i, and BMW X4 xDrive30i models also add a SPORT+ mode. The engines under the hood of BMW M Performance Automobiles stand out with their instantaneous response and tireless power delivery. With its trademark free-revving performance, maximum output of 355 hp and peak torque of 365 lb-ft, the power unit in the all-new BMW X4 M40i enables it to accelerate from 0 to 60 mph in 4.6 seconds. Reduced weight, enhanced aerodynamic properties. An intelligent material mix has made it possible to bring about a substantial weight saving, not just in the chassis design but also in the body’s construction. 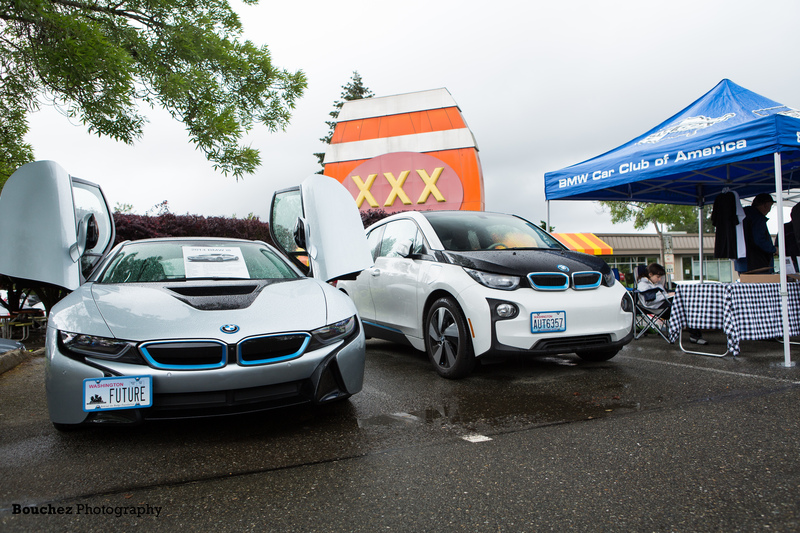 BMW EfficientLightweight measures led to the increase in the proportion of aluminum as well as high-strength and ultra-high-strength grades of steel. This has made the body structure more solid than ever, serving up benefits for both vehicle agility and occupant protection. Additionally, the car has a significantly lower center of gravity which enhances the Sports Activity Coupe’s cornering dynamics. Another factor in the dynamism and efficiency of the all-new BMW X4 is a reduction in aerodynamic drag of around 10 percent. This advance has been achieved by streamlining the body at the same time as incorporating a raft of additional measures, including active air flap control, the Air Curtains in the front apron and additional underbody cladding. The all-new BMW X4 sets a new benchmark in its segment with a drag coefficient (Cd) of 0.30. The latest version of the system is lighter and more efficient. Plus, the wonderfully precise electronic control of the intelligent all-wheel drive also splits drive power to the sporting effect for which the brand is renowned; the rear-biased set-up produces a highly rewarding driving experience, especially when powering through corners. Besides offering BMW handling stability, BMW xDrive also enhances traction over loose terrain, providing the all-new BMW X4 with tremendous off-road capabilities. With a ground clearance of 8 inches a fording depth of 19.6 inches, break over angle of 19.4° and angles of approach and departure of 25.7° and 22.6° respectively, the Sports Activity Coupe takes everything in its stride, from crests and bumps in the road to gravel tracks, icy roads and steep slopes. The all-new BMW X4 boasts a marked increase in agility combined with a high degree of ride comfort, courtesy of chassis technology that has been systematically refined and honed for the specific requirements of the Sports Activity Coupe. The design principle of a double-joint spring strut axle at the front and five-link rear axle forms the ideal basis for a harmonious blend of dynamism and comfort. Fitting aluminum swivel bearings, lightweight tubular anti roll bars and new wheel location components at the front axle has brought about a considerable reduction in unsprung masses. Standard specification for the all-new BMW X4 xDrive30i includes not only M Sport suspension but also variable sport steering. Specially tuned to deliver extra-dynamic handling qualities, this version of the Electric Power Steering system ensures slick precision through keenly taken corners and straight-line stability. The speed-sensitive Servotronic power assistance, meanwhile, makes light work of maneuvering. The car’s impressively sporty and well footed handling characteristics are enhanced by the powerful lightweight braking system and the Dynamic Stability Control (DSC) system, whose wealth of features includes the Antilock Braking System (ABS), Dynamic Traction Control (DTC), Automatic Differential Brake (ADB-X), Cornering Brake Control (CBC), Dynamic Brake Control (DBC), Start-Off Assistant and Hill Descent Control (HDC). The Performance Control function also included as standard gives the all-new BMW X4 even sharper handling by varying the distribution of drive torque to the rear wheels according to the situation at hand. 19-inch light-alloy wheels also form part of standard specification, while wheel options offered include 19 inch, 20 inch and 21 inch wheel offerings.